In the first, colour is made out to be the property of some ‘foreign’ body - usually the feminine, the oriental, the primitive, the infantile, the vulgar, the queer or the pathological. In the second, colour is relegated to the realm of the superficial, the supplementary, the inessential or the cosmetic. His theory made me seriously look at why I disliked the front cover so much. Did I not like it because the colors were unnecessarily bright? Because I saw them as immature? Throughout the book, he tediously traces this phobia’s roots back to the very beginning of philosophical thinking. He gets all the way back to Plato, who once said that a painter was just “a grinder and mixer of multi-colored drugs.” Plato had a lot of confusing things to say, but this, this I understand perfectly. He was saying that artists were JUST mixing colors. Plato, they were not just doing anything. Colors allow artists to express emotions and bring things to life. An artist can’t really paint an emotion like joy with black and white. Batchelor points this prejudice out time and time again in this book. White is good. Red is bad. The idea of color use is often deemed frivolous or even sinful. The Bible is not the only piece of literature emphasizing this belief. Batchelor uses quotes from Melville, Le Corbusier and Huxley to demonstrate the power of white in Western art. This is a devastatingly beautifully written book. It saddened my heart that all of the wonderful literature pieces included in the book were more or less against the use of color. Batchelor has packed a lot of information on color use in the past 200 years into 111 pages, so every page is a big bite. Every chapter has great arguments, and made me examine why I view certain colors the way I do. I remember reading this book as an assignment in Color Theory, and found it to be the most interesting thing I did in that entire course. I think we can all tie some memory of youth and the bright colors that are everywhere growing up (every overly-saturated Saturday morning cartoon or kindergarten class blanketed with primary colors) and compare it to the colorless adulthood which we become accustomed to as we grow up. Western culture's disregard of color as immature and primitive have even seeped into other cultures and it is becoming more and more apparent in their contemporary decorating and architecture. Overall, you really covered Batchelor's book and his research of the origins of our fear of color quite well. White is used in galleries and museums as a neutral backdrop for displaying art as to not influence the colors present within the art displayed. White is deemed as antiseptic, clinical to denote an essence of purity, not in the metaphysical,"biblical" sense but as in void of any hues. An art collectors home thus would parallel the walls of art institutions. There is literature discussing the use of white as an institutional phenomenon within the art world that would in my opinion be more effective in criticizing the museum esthetic. I found this post very interesting and was drawn to it because of the garish book cover, which maybe repulsing and painful to the eye but none the less is still very eye catching. I also found the point about white being used to look more "put together" very interesting. Yes, when it comes to displaying art in a museum or home white walls allow the viewer to see the work uninhibited. I strongly agree that it is a big part of western cultural belief that white is for a sense of purity, especially in clothing. 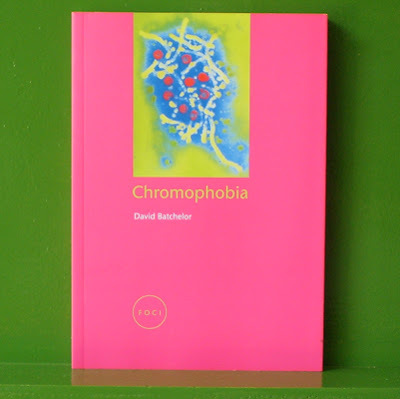 As Rachel also said, I remember reading Chromophobia in Colour theory class. You included a description of the chapter that I enjoyed most from the text: 'Whitescapes'. As cold as the chapter makes one feel while reading it, it brings warmth and a comforting knowledge when one thinks about all white rooms. I started dreaming of all white beautiful interiors after reading that chapter, and it seemed relaxing compared my colourist ways in the painting studio. I think you executed your review of Chromophobia well, and would stimulate interest in ones who have not discovered this fantastic text! Im going to definitely look into purchasing this book for my own self and read over it and see what I can personally take out of it. This almost feels like a psychology book from the description and how we change around colors. Well done! I too read this book for color theory, and found it an incredibly interesting read. The relationships between chromaphobia and chromaphilia are very well laid out and presented. The only thing that disappointed me was that the article used and incorrect title for a Rolling Stones song, but later made up for it by bringing up Screamin' Lord Sutch, who everyone should check out!